We had hosted our popular ‘Funding for Science, Tech & Innovation’ event once again this week to go over the funding options available to entrepreneurs in these all important sectors, which are most actively supported by UK investors & service providers. 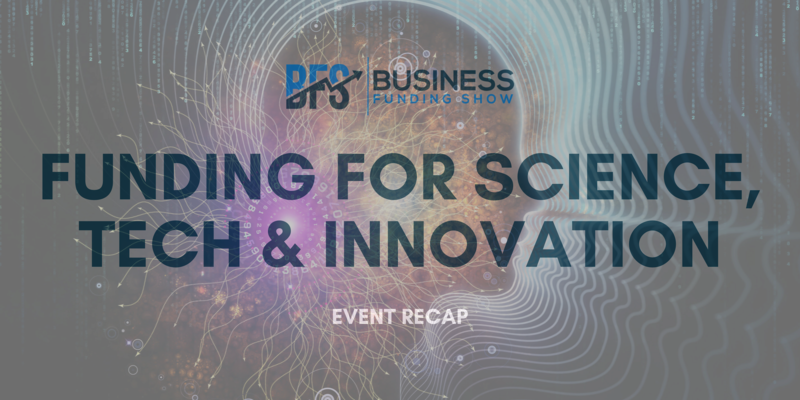 The Business Funding Show invited representatives from selected top funding bodies interested in the science & tech industries. Attending funders included: Adrien Allen from Newable, which has a 35-year track record of providing lending, investment, advice, and property services; Oli Hammond from SyndicateRoom – a sophisticated investor-led crowdfunding platform; Leo Castellanos from Saatchinvest– a seed venture capital vehicle investing in early stage (seed to Series A/B) tech startups; Eileen Modral from business angel network OION; Simon Spier from TechUK– a network of 950+ member tech companies; Anthony Carty from Alternative Business Funding– a debt finance search platform; Annie Hunter from innovation funding service provider GovGrant; and Uthish Ranjan from award-winning & fast-growing fund management firm Octopus Investments. Science & tech entrepreneurs need to remember that their sectors are very broad – and a lot of funders will specialise in particular areas. As an entrepreneur you need to be strategic, do your homework with who you approach, and make sure they absolutely understand your sector! Uthish spoke of the things that could make your pitch deck stand out: 'a perfect criteria match, great company story and a qualified introduction' is an excellent start. Anthony added that you should also be able to 'put all your cards on the table'. Your business plan should describe your marketplace, future plans, the need for additional funding, as well as past and future financials. Without this information presented clearly and accurately, funders will not be able to determine your suitability, and your pitch deck might not be looked at twice. As Eileen said, 'IP, patents or defensible engineering innovations are often the most valuable assets a company possesses'. These are the things that can set you apart from others, and need to be leveraged at every chance. Your suitability to a particular funder might also be decided on whether your business is tech-enabled, or tech-centred. There is of course a place for both, but certain investors might lean more towards one or the other. Leo explained that 'investing in tech-enabled companies is relatively cheaper and gives quicker return on investment compared to tech-centred businesses'. On the other hand, tech-centred businesses have a potential to bring in high returns later on (but this comes with a significant risk profile). Therefore, it is essential to find out the preference of your potential investors. The second aspect to consider is B2B vs. B2C. As Oliver pointed out, a lot of investors will be more attracted to B2B models as 'they are more stable and most times there is a recurring revenue stream'. That is not to say, however, that the right B2C company is not attractive. Traction, proof of concept, early customers, market potential and relative scalability, along with a good marketing strategy are all factors which will work in your favour! Usually, the decision of equity vs. debt largely depends on the stage your business is at, how much money you need, and when you need it. While equity can be an attractive option for startups with no trading history, debt is non-dilutive, and can often be often be preferable to entrepreneurs who don't want to give away too much control of their business. For anyone interested in debt, you can check out our Loan Finder! Another important option to consider is government schemes. As Annie stated, 'the majority of eligible companies do not claim their entitlement to thousands of pounds of government funding each year'. The largest government incentive funding schemes for business are R&D Tax Credits (which gives businesses up to 33% of eligible development costs back in cash every year of qualifying activity) and Patent Box (which reduces corporation tax on profits from patented inventions to 10% for life of patent). This is highly relevant to science and tech; therefore we strongly encourage all entrepreneurs in these sectors to check their eligibility! You can check the GovGrant website for more info. We hope that all attendees have found this event informative, and that after following the tips and advice of our panellists, it will have brought them a step closer to finding science, tech & innovation funding! Missed this event? If you would like to know how to utilise grant funding, and are looking for something different this Halloween, join us at our 'Boo! Don't be Scared of Grant Funding Applications' event, which will take place at 6pm on the 31st of October at WeWork Chancery Lane. Click here to book your tickets. Alternatively, if you would like to brush up on your equity funding knowledge and options, check out our full-day 'Investment Conference', which will be happening on the 13th of November at Cocoon Networks London. Click here to book your tickets.